Finally, a glue brush that you'll never have to throw away! 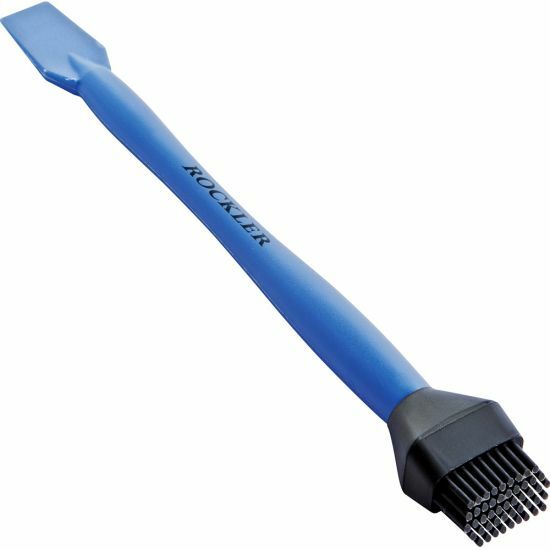 This brush features silicone bristles that are easy to wash with water, and quickly shed dried glue for long-lasting service. They're also spaced to hold plenty of wet glue, meaning less time dipping and more time spreading. Use the narrow dimension for edges and the wide dimension for faces. The paddle end opposite the bristles can be used like a pen for finer detail work such as mortise and tenon, dovetail, and box joints, or like a spatula for spreading glue into grooves and mortises. 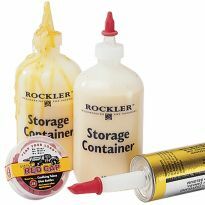 Also available from Rockler, the 3-Piece Silicone Glue Application Kit (#43662, sold separately). It's easy to clean without chemical solvents - even fully dried polyurethane glue cracks and peels right off the bristles - and re-using the brush is also friendly to the environment. When it's time for a glue-up, simply riffle the bristles as you would a deck of cards to peel any dried glue off and restore the brush to pristine condition. 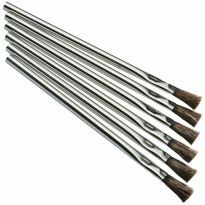 Unlike traditional brushes, this one won't shed bristles into your bead of glue. The entire brush is waterproof, so rinsing thoroughly with warm water makes cleanup easy when glue is wet. Silicone Glue Brush measures 7" long. 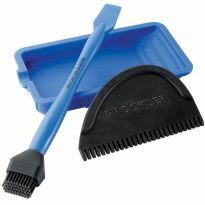 The tapered brush tip measures 1" wide x 1/2" deep. Forget the other types, this is my go to glue brush every time. I have use this as a hobby for over 4 years now, someone give it to me as a gift and I use it a lot. Forget to clean it no problem, comes right off. I keep a water bowl close and wash it out after useing to keep it cleaner when needed faster. Love it. Have purchased this brush in the past and am very happy with it. Bought this as an extra (I bought the complete kit, too) and it works great. Dab on and spread the wood glue, clean up if possible. If not possible to clean it up while the glue is wet, then after it dries it just peels right off. Great idea and product! Great brush. Let the glue harden and just pull it off! Piece of cake. Works really well and you don’t have to worry about making a mess. Very good product. Works like a charm. Easy cleaning and saves so much time. I admit that I only got this to bump my dollar amount up over $35 for free shipping, but this thing really is nice. I have been using it to spread glue in 1/16 wide spline slots and I like it. I especially like that I can let thhe glue dry and then bend it a bit and it pops eight off. Great to work with easy to clean . Great product, well worth the money. 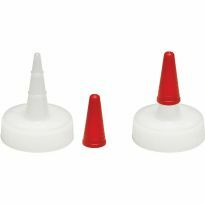 Great product easy to clean and makes the job of glueing clean and simple. 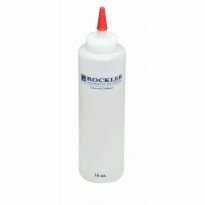 Makes applying glue clean and easy. I would recommend to anyone! Easy cleanup after some pretty precise glue spreading. Super brush for glue spreading. Cleans easily with soap and water and any glue dried peels off. fantastic tool. 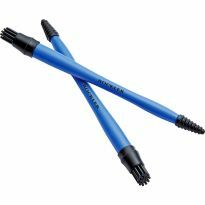 I have had some for several years and they work great and clean up is a snap. I like using on larger glue up projects. spreads glue liberally. If you want light glue not as good as an acid brush. The spade end works great to remove squeeze out. cleans up well for next use. These are great and I use over and over. Note that it is best to NOT try to wipe the glue off. But rather, leave glue on and let it dry completely. Then you can peel it off of the silicone brush and it's ready to use again. Used this for the first time, and am happy to say I no longer have glue all over my hands! Great product. A great little product and a must have. I should have gotten one years ago. It makes clean-up a snap. Great tool, the flat end works great for removing squeeze out glue from corners as well! Very easy to use and cleans up easy. Also a great value. Made gluing blocks for a butcher block table so much easier and clean up was a breeze! I bought an extra last time I was over as they work that well! 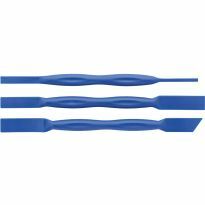 These brushes are very easy to clean and do a superb job of spreading the glue. 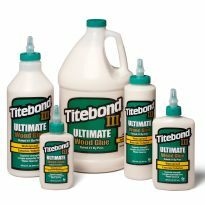 Works great with water based glues. But don't use it with polyurethane glues. Almost impossible to clean from the rubber brush. Works very well. Cleans up easily. Great brush. Spreads glue very well. The flat on the end is ideal for spreading glue in biscuit slots. Cleans up very easily. Good for spreading glue fast. Easy cleanup and time saver. Would recommend almost every job. My husband is happy with this brush.. He was excited to have one as he was using his finger before. I had never tried a silicone brush for spreading glue, but given how well silicone works in the kitchen, this seemed obvious. The brush works well for getting glue deep into corners, and the flat end helps with squeeze out. Plus, it's a breeze to clean up (depending upon the glue used!). Handy glue spreading brush. Glue comes out of bristles easily. As a child, I used to peel sunburned skin, to the aggravation of my mother. For 50 years, as a husband, I annoyed my wife by peeling glue off my fingers. This brush is magical...and fast, too. Better late than never. Let glue dry, wait two days, pull out glue. Satisfaction. The flat bit of this brush is great for mortises, domino mortises, splines, or to precisely apply frosting to delicious fudge brownies. The brush bit is silicone. I use it on edge glue-ups. It's great, I apply a bead of glue and run down the edge, turning the brush. Something about the bristles prevents too much running of the glue off the edge. For smaller glue ups, I like the dip method. Find your favorite container (I use my wife's coffee mug) and put a little glue and dab your brush. Easy peasy. Most importantly, let the glue dry on the brush. Do not wash it off. You'll thank me later when you pick a big glue mold of the brush off with strange satisfaction. Easily applies glue to large tenons without creating excessive squeeze out Easy to clean by letting the glue dry and peeling it off. No glue sticks to these brushes. One of my favorite gluing tools. The "brush" end is not too soft, not too stiff, just right. And if the glue dries, you can relatively easily remove it from the non-stick silicone bristles. Dried glue comes right off no problem! Glue peels right off; applying/spreading mucilage is precise. Works great. Can rinse or let dry, either way the glue comes off. 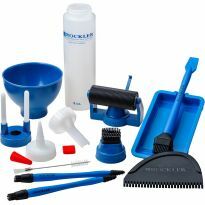 Got it in kit when it was first introduced, with a silicon tray, two smaller silicon brushes, a larger job silicon spreader, a second brush, and the best glue scraper I have ever used. 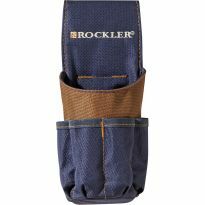 It was a great kit, but I can't find it on the Rockler site any longer. :( I would buy it again. I use polyurethane glue most of the time and it is a pain to get it off if you touch it. There ain't gonna be any magic touch unlock on your phone for days. But this tool makes it so easy to apply glue and also makes it easy to remove excess glue. And the way it is made (unfortunately not in the US), it might last for ages. I was hesitant at first that this would even work given the glueing power that is available these days but it works great. Simply let the glue dry and it peels right off. I use them for all glueing projects now. I been using ice cream sticks to spread the glue, no more! This is the 3rd or 4th one of these I have bought. It works great, if I could keep up with them I wouldn't have to keep buying them. Very handy, reusable and durable. One isn't enough when you're doing a lot of gluing. Looked like a great brush to spread glue evenly and not having to use finger to spread the glue. Have heard how great this glue brush is and decided I needed to add it to my shop tools. I am going to try them with my Leather work. Just trying for first time. Needed a more efficient way to spread glue! Been wanting to try one for awhile. I use them all the time for furniture projects and their easy to clean plus you don't have to throw them away if you forget to clean them. Brushes are new to me, but other silicon ones I have work well. I take woodshop in high school and we don't have anything to spread out the glue, it always makes a mess. The quality is excellent. Prefect for craft projects. Better than using a finger! Bought this brush before and it works great! Can I use this for applying resin / epoxy, and will it clean-up as easy as glue? BEST ANSWER: I lft mine fully coated with a big glob of epoxy. Had to use a pliers to break up the epoxy then remove it. Used it again today and wiped most of the epoxy off, will see if easier. How do you remove old glued in reed? BEST ANSWER: Depends on the type of glue ... I only use wood glue and after it dries I simply peel it off. I have not had experience with other types of glue so not qualified to address. 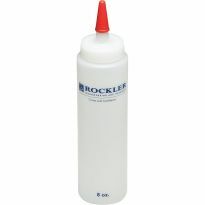 Do you need this and the glue to use graphite paper while putting design on wood? BEST ANSWER: I've never used glue for graphite paper. I would use witness or reference marks on your pattern so you can always reference it back to the same spot.